So, as we move into this second week of 2019 there still seems be a general sense of angst, malaise, and anxiety within our world – especially here in the United States. We are still in the midst of a partial government shutdown where countless individuals are being affected. This is something that affects federal workers, veterans, and those depending on the limited support of things like food stamps to help make ends meet so that their families might be able to eat. Now, of course there are differing opinions on how this shutdown can be ended, and there is a good chance that my opinion and yours are vastly different. But, I’m not here to talk about that this morning. What I do want is to dive into is our text from Isaiah. You see, the people of Israel during the time that this part of Isaiah was written weren’t in a good spot either. For them, things were shutdown too. They were exiled, sent far off from their homeland. Not able to worship and live into the ways that they had for generations. Thankfully, that time was soon to come to an end, but they didn’t know that at this point. For as the saying goes, the darkest hour is just before the dawn. Isaiah shares this promise of God with his people as they continue in their exile from all that they’ve known. Here God speaks the words that are some of the most repeated throughout scripture and includes one phrase that only appears here. God again says, “Do not fear.” Do not fear and all its variations are the most repeated phrase from God throughout all of scripture. Do not fear. Why? 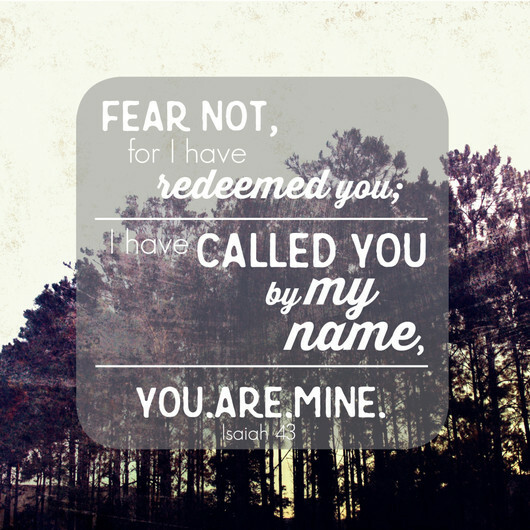 Because you have been redeemed. You have been called. You are mine. When times get tough – God will be with you. When things become overwhelming – God will be with you. When it doesn’t seem like you can go any further – God will be with you. God will be with you, because God is the one who has created you and God is your God. That is the promise that God makes with the people of Israel, God’s chosen faithful. God speaks this promise of hope to a people who feel that all is lost. Enough time has passed that it appears that hope is gone for this people sent away from their homes, barred entry from their place of comfort and safety. Yet, here comes God speaking through the prophet Isaiah – one of the great prophets – and gives this promise again. This promise of hope, restoration, and redemption. But, I do find this promise of hope to be a bit different than how we’d want it to be. When we call for God’s redeeming power, for God’s protection, for God’s hope to rest in us, I think what we really want is for all the bad stuff in our life to be ended. We want there to be no more trouble, no more pain, no more heartache. We want there to be no more angst, no more anger, no more fighting among all. We want it to be perfect because of God’s redemption, power, and protection. We want God to remove ‘us’ – whether we think of that as solely as ourselves as individuals or as the people we ‘agree’ with – from that which brings us pain or frustration. I think we truly want that to happen. And why wouldn’t we? It sure would make this all a lot easier to live through if we just prayed, had ‘enough’ faith, and God swooped in, plucked us from that which causes discomfort and sets us up in a perfect little place full of comfort and tranquility. But, that’s not what God promises. Not even close. God tells the people of Israel – God tells each of us – when things get difficult, and they will, I will be there. When things become overwhelming, I will be there. When all hope appears gone, remember I will be there with you. I imagine that is what God is speaking to us as a people right now – those for whom this shutdown doesn’t affect in intimate ways (but, boy do we like to think it is) and those for whom life seems absolutely bleak during this time, especially for those who are furloughed or working without pay. I imagine this is what God is saying to those who find themselves at our border as well – those who have traveled long distances to escape tragedy, pain, and fear and have come to take asylum in a place where they can start over. God speaks to them – and to us – I am here. So, what does that have to do with baptism? Since this is the celebration of the baptism of our Lord. We as a people of faith – as Christians who follow the one born to the world as messiah – as God come down to be with us – see that redemption in our baptism. That place and action where God cleanses us, calls us by name, and claims each of us as one of God’s own. I think we like to believe that baptism will make everything just peachy and fine. Once we’re baptized everything will be wonderful and bright! I see that way of belief being lived out in some other traditions of the church. Mostly because when things don’t go that way, folks feel compelled to ‘do it again’ because it must not have ‘taken’ the first time. I’ve talked with numerous people throughout my ministry who tell me of the multiple times they’ve been baptized because those previous times ‘didn’t stick.’ Or who desire to be re-baptized because life just isn’t ‘good’ at the moment. That just isn’t what I feel baptism ‘does’ for us. That isn’t even what baptism was for Jesus. He didn’t get washed and didn’t have to deal with danger anymore. In fact, you might say that baptism thrust Jesus into danger because it is in those waters that he began to live fully into God’s call for him as messiah. It is in baptism where all the ‘trouble’ begins. God’s glorious trouble of radical love, inclusion, grace, forgiveness, and welcome. Baptism does not remove us from danger. It does not make evil flee from us. It doesn’t even magically make us incredibly perfect and sinless people. It just doesn’t. But, what baptism does do for us is claim us into God’s family. In baptism – because of what Jesus has done and continues to do in his death and resurrection we are grafted into the family and promise of God’s own people. Because of baptism, we are indeed cleansed of our sin where God looks upon us with love, grace, and mercy. It is in baptism that we are claimed by the one who created us all. In our baptism – through Jesus’ love, sacrifice, and victory on the cross and in the tomb – we too are covered in this promise that Isaiah speaks to the people of Israel. We too have faith and promise that God is with us always. That God is with us as we walk through the waters; that God is with us when things become overwhelming; that God is with us when we walk through the flames. In baptism we remember that God is with us, BECAUSE of the thing that God says here in Isaiah that appears no where else in all of scripture – at least not literally said. It is here that God tells the people – I love you. Yes, God has lived out that love countless times throughout all of scripture and our combined history as people of faith. But it is here that God specifically says to us – I love you. God loves you. God loves you through baptism. And in that love, God promises to be with you. Always. God has made that promise and there is nothing you’ve done to earn it, there is nothing you can do to remove it, and there is nothing you can do to ‘increase’ it. That mark, that promise, that love, is always there. Fully, completely, and thoroughly. We celebrate that promise of God that is extended to us through baptism, where we are indeed called and claimed into the people and family of God because of what Christ has done for the world. In baptism, we are joined together with the one who is with us; the one who has come down to be with all of creation. In this great community of life and love, we get to live into our baptismal calls of hope, justice, and righteousness. For even though our government is still ‘partially shutdown’ it does not shut us down to live into the love and care that God calls of us to live out for all people around us. Baptism – it won’t always be easy. It won’t remove us from danger or trouble. In fact, it may just push us to be at ‘odds’ with those who cannot see or feel God’s radical love and grace through Jesus Christ. But, we remember the promise that God has for us; that same promise that God gave to the people of Israel through the prophet Isaiah. God is with us. God is with you. Always. No matter what. Amen.